If you’ve been working out for months and still feel sidelined after each workout, you may have an underlying issue. After-exercise tiredness stems from anything from inadequate eating habits to breathing difficulties. So if symptoms don’t improve, it’s best to see a health care provider for an accurate diagnosis and treatment. When blood sugar levels drop too low, exhaustion may occur. Pre-workout meals prevent this by stabilizing blood sugar levels. Eat a high-carbohydrate, moderate-protein and low-fat snack between one and three hours before working out. This can be a banana, oatmeal, juice or low-fat yogurt. After-workout meals eaten within 20 minutes also help. A snack with a 3-to-1 ratio of carbohydrates and protein will restore glycogen and replenish tired muscles, according to the Academy of Nutrition and Dietetics. Good post-workout snacks include trail mix, yogurt with granola and chocolate milk. Dehydration can lead to muscle fatigue, heat exhaustion and diminished energy levels, according to the American College of Sports Medicine. To monitor hydration levels, weigh yourself before and after each workout. Also monitor the color of your urine, which should be light. Drink eight to 12 ounces of fluid 15 minutes before working out. Drink at least 3 ounces of water every 15 minutes during your workout -- make that a sports drink if you exercise longer than an hour. Within two hours after working out, drink enough water to replenish each pound lost. The rule of thumb is 20 to 24 ounces for each pound, according to the American College of Sports Medicine. Post-workout tiredness may simply be a case of “too much, too soon.” The body needs rest not only to repair itself but also to grow stronger. 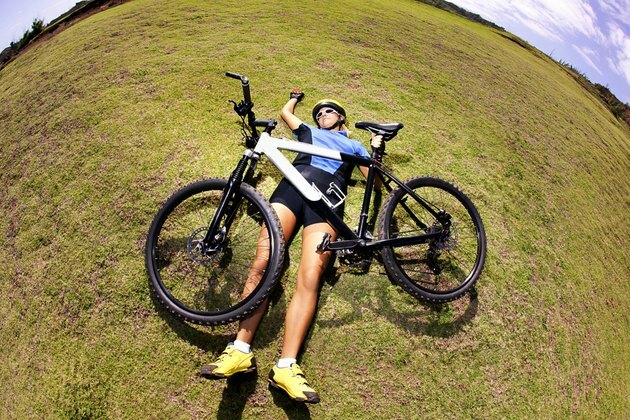 Not allowing for sufficient rest may lead to fatigue and future injury. In addition to fatigue, over-training causes moodiness, confusion and impaired immune reactions, according to the American Council on Exercise. Incorporate at least one rest day after vigorous exercise. According to a report published in the August 2011 issue of “American Family Physician,” more than 10 percent of the population has exercise-induced bronchoconstriction, which causes asthma symptoms in those with and without asthma. Symptoms include shortness of breath, coughing and chest tightness. It may also result in fatigue and the feeling of being out of shape after exercise. If you experience exercise-induced bronchoconstriction, you should warm up between five and 10 minutes before exercise. Your physician may prescribe a medication to be taken 15 minutes before exercise.